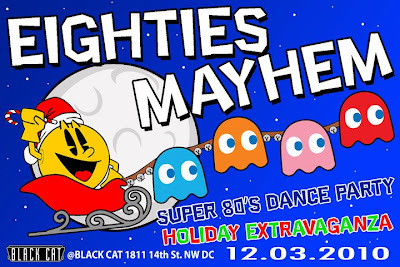 today i want...: Eighties Mayhem! Tonight is Eighties Mayhem's Holiday Extravaganza at the Black Cat! Come out with your bestest holiday ensembles so I can snap some photos of you for this here blog here ya hear!? I'll be the giant lady on stage in a vintage grey tulle dress aquired in lovely Amsterdam and patent red shoes. And maybe, just maybe some big glittery poinsettias. Did I mention we have a snow machine? Well, we do. Snow tonight at the Black Cat!